This book presents a comprehensive theory of why human freedom gave way to increasing oppression since the invention of states - and why this trend began to reverse itself more recently, leading to a rapid expansion of universal freedoms and democracy. Drawing on a massive body of evidence, the author tests various explanations of the rise of freedom, providing convincing support of a well-reasoned theory of emancipation. The study demonstrates multiple trends toward human empowerment, which converge to give people control over their lives. Most important among these trends is the spread of 'emancipative values', which emphasize free choice and equal opportunities. 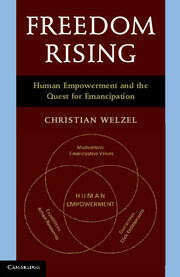 The author identifies the desire for emancipation as the origin of the human empowerment trend and shows when and why this desire grows strong; why it is the source of democracy; and how it vitalizes civil society, feeds humanitarian norms, enhances happiness, and helps redirect modern civilization toward sustainable development.